I consider myself a novice beader and have yet to develop a particular style or direction. I take my beading seriously, but I still have a lot to learn and explore. For the moment, I am treating my beads as an extension of my paintings, looking for balance and beauty in design and color. In all of my artistic endeavors, I love to break my own barriers. Every fence I set up I want to jump. I aim to be practical but am always tempted by fantasy and the outrageous. Color. I love color--and anything that shimmers and glistens. I may be part crow. I have fallen in love with pearls. Since my oil painting focuses on seashells, someone suggested that I should work with pearls as a tie-in. 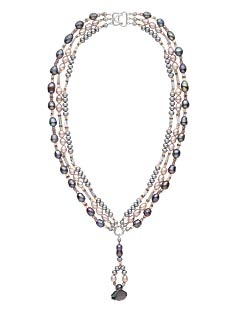 It soon became apparent that pearls and oils possess that same luxurious depth of vibrancy and color. ''Nacre,'' a word uneasy on an American tongue, is one that describes the luminous layers of both. The symbolism of pearls appeals to me as well. Like people, each pearl is complete and beautifully unique in and of itself. It is also interesting that such beauty is produced only through the oysters' struggle with daily irritation. I take great comfort in that. I wanted to do something more ambitious, more complex than I had attempted before. And again, I love color. Playing with the various colors of freshwater pearls, these three strands resonated and harmonized: the color of one strand contributed to the others' beauty, and they didn't quarrel visually. I also wanted to see if I could minimize metal, which someone suggested might damage pearls, and rely instead on glass beads to spark accents of color and shine. It was primarily intuitive, although I attempted to plan it out on my beading board. As I began to play with combinations of colors and shapes of beads and pearls, patterns appeared, and I chose the ones that were most pleasing. I always look for relationships and patterns that unify and interrelate the different strands into one piece. I follow their lead. The drape was a complete surprise--I originally had something else in mind, but I really liked the result--so I resisted the urge to ''fix'' it. I can remember sitting cross-legged on the floor at four or five years of age playing with my ''Snap-Beads.'' My mother always encouraged me. But by the time I was twelve, she ''hired'' me to make Christmas ornaments with Styrofoam balls, ribbon, sequins and beads. Throughout my life, I've made small projects of necklaces, first for myself, then for family and friends. An artist friend was taking classes in beading, and introduced me to other materials and techniques. I was impressed with her work. She was also a professional designer and illustrator, so I realized I didn't have to limit myself to my paintings. I have been a professional artist for many years. After college, I interned with a nationally known illustrator, followed by a seven year stint as an artist for Hallmark. For more years than I care to admit I owned my own illustration studio, where my work ran the gamut from storybooks to illustrations for national advertising campaigns. Currently I operate the DS Art Studio and Gallery with my husband, artist Don Stewart. Don is known for his distinctive ballpoint pen imagery, while I paint my Shells, portraits, fantasy pieces and teach a handful of students. And, of course, I play with my beads! I learned about Fire Mountain long ago from a catalog of art magazines. Three years ago my husband met another beader at an art show, who echoed the recommendation. I've been hooked ever since. Jewelry making is my rewarding part-time hobby/career. I'm just dipping my toes into the water now. I find beading to be a refreshing expansion from painting and drawing. It allows me to focus on patterns, shapes, colors and textures in 3D. Also, I can't forget what a young man told me at a beading and craft supply store. I have found it a comforting activity as I process events and emotions. I have my work displayed here in my studio, at art shows and online at www.ZooLN.com. There are several causes that I support with my paintings now, and I hope to have my jewelry participate in the future. I would tell them what I tell myself: ''I wonder what happens when I put this bead and this one together like this.'' It's that simple. View all of Sue Ellen's designs in the Gallery of Designs.